We've had as many as 20 people on stage at once. 7 guitars, 3 basses, 2 or 3 drums sets. One of the gigs we did at a warehouse was basically all night. We had people just stepping up and playing. And I like that. I like the idea of having people just jump in, jump out, make a little noise, do a little dance. It's very eye opening and mind opening whenever we get together to perform. Somebody always has some new thing they're working with or some new gadget or device they want to try out. On Spiffy, Automatic Music returns with more of their LCR... Live Concept Recording... in which the band plugs in and lets loose with improvisational mayhem and fun. Spiffy consists of 6 tracks, some being lengthy stretch out jams, that explore the heavier side of acid psych rock. "Chester In The Middle Of An Innerstate" opens the set with mad freaky electronics along with multiple guitar parts, all playing something completely different. Bluesy bits and Frithy/Frippy sections are all played at a moderate pace against the frenzied space synths. "Deep Wounds, Deep Brood" is like a tripped out Blues or acid rock Beefheart tune. I dig that droning Bluesy bass. "The Anvil Approach" is a gorgeously raw mindfuck acid garage rocker with SCREAMING guitar licks. The pace is frenzied and fans of total rocked out chaos guitars won't know which direction to turn because this sucker is shooting flames in every direction at once. "And More... And More... And" is similar but much deeper in heavy rockin space stoner rock territory. Automatic Music couldn't have picked a better title for the 18 minute "Egg On Pavement/Congeal/Crushing". It a solid free jamming improv rock track that recalls the Kosmiche bands like Amon Düül, Guru Guru, and the like, has a funky feel at times, but is firmly in the avant-experimental realm as well. Fans of freakout music that listen closely while they trip out are guaranteed to hear lots of tasty ideas on parade. Mucho impressive and inventive guitar parts and crazed electronics. Reminds me a little of Vas Deferens Organization. And on "Snakenedrix, Attempt #1" we get a title that... hmmmmm... does the title combine Snakefinger and Hendrix? Probably. The Snakey one's influence is mighty prominent in the first minutes of the track. This tune sets a nice raw groove and jams fluidly for 12 minutes. The rhythm keeps a rolling pace and the bass has a deep thud-in-yer-chest sound, while the guitars kick out aggressive licks that are foot stompin rockin but have a King Crimson-ish complexity that keeps things varied and interesting throughout. In summary, this is by far the strongest and most coherent Automatic Music disc I've heard yet. As free-wheeling as it is this is actually one of Automatic Musics more composed sounding releases yet as well. I told Fred Hall this sounded like mostly the same musicians on the entire album and he revealed that this was the case. 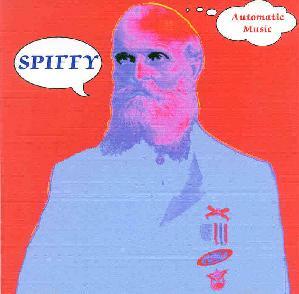 Spiffy is definitely the place to start if you're new to Automatic Music. But all are worth checking out so read our reviews of their earlier releases in the AI alpha index. Automatic Music is distributed by Szum Music. You can visit their web site at: http://www.szum.com. At the Szum site you'll fine information not just on Automatic Music, but also Gentlemaniac, East October, Tragic Bunny, Jo and Jo, Hipbone, and others. Spiffy and other Automatic Music releases are available for $10 postage paid in the USA from Szum; 504 Liberty Pl; Archdale, NC 27263.